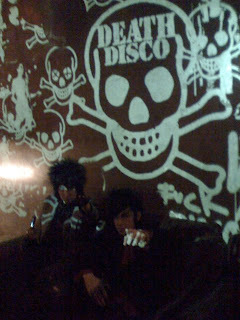 In October of 2008 I followed The Hunt on a tour of the dingiest clubs and pubs of London. I'll save the sordid stories of subsidized housing, strippers, and vegan breakfasts for later, but the marauding of that week was quite impressive. To sneak a peek at the spectacle, I've got this little lo-fi video clip of the boys performing "Summer of Hate" at Notting Hill Arts Club's infamous "Death Disco" night. 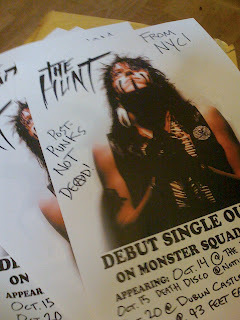 Currently recording a full-length, (which may include this track), The Hunt have been one of my favorite post-punk-apocalyptic groups to scar the city's stages since I caught their second show ever back in 2006.
stunning !! it was amazing !! thank you for sharing it with us !